I had been shoveling our driveway and decided to take a break. While hunkered down in our garage behind our car, I thought I saw a large dog approaching from the side of the house. Without thinking, I cheerfully greeted the animal with "Hello there." 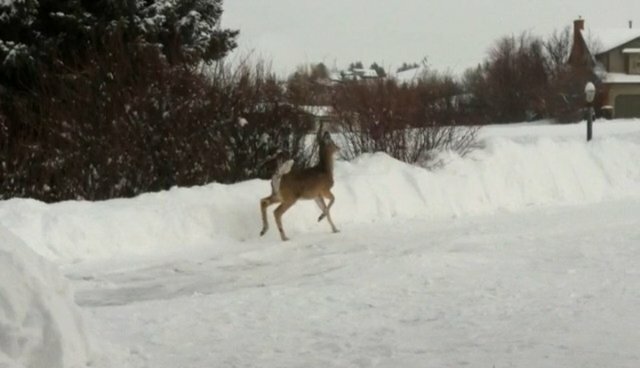 That's when I came face to face with a deer - not a large dog. The poor creature's eyes widened and they bolted out of the garage entrance and up our driveway. Fortunately I remembered I had just had my iPhone on video so I grabbed it and pressed record. The close encounter got my adrenaline rushing, so the video is a tad shaky. I have to say being nearly five feet away from a deer has been one of the most awesome life experiences I have had.